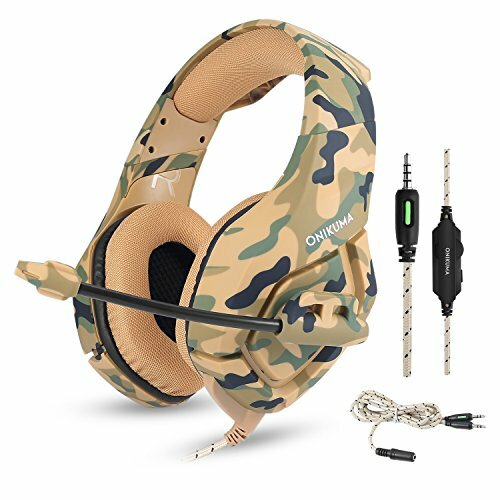 VERSATILE COMPATIBILITY: ONIKUMA Camouflage Gaming Headset with 3.5mm combo connector is suitable for PlayStation 4, New Xbox One, PC, Mac, laptop, tablet, smartphone, iPhone, Samsung, LG, Xiaomi, iPad, etc. A Microsoft Adapter is needed if for Old Generation Xbox One. GREAT STEREO SOUND: Gives you an experience of an immersive 360-degree stereo sound. Capture the flying bullets, footsteps and all effects in games easily and deliver a clear, crisp and rich sound. OMNIDIRECTIONAL MICROPHONE: Noise reduction sensitive microphone with rotary arm, enable you freely adjust at any direction for exact pick up. GREAT DESIGN: Built-in simple line-in controller for quickly adjusting its headset volume and mutes microphone. Cable can be divided into two parts, so that you can freely control its length when using with different equipment. DURABLE QUALITY GUARANTEE: Made of high grade ABS material, matte finish surface makes it good looking and scratch proof; Braided cables to increase the lifespan of the headset before becoming a victim of loose wiring. Awesome new headset for everything!